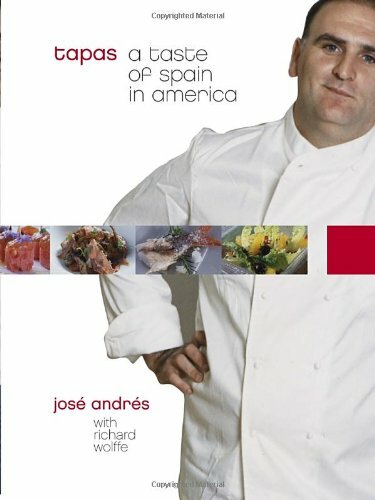 The first major Spanish cookbook in two decades, from José Andrés, recently named America’s Chef of the Year by Bon Appétit. All these recipes are full of tremendous flavor and creativity, as well as in-depth ingredient notes and a rich atmosphere that will transport you to the lush countryside, hip cafés, and sun-drenched coasts of Spain—and back again to dinner at home. This is a breakthrough cookbook from an extraordinary chef. Internationally recognized as a culinary innovator, José Andrés is a James Beard Award-winning chef and owner of ThinkFoodGroup. TFG is the team responsible for Washington, D.C.’s award-winning restaurants Jaleo, Zaytinya, Oyamel, Café Atlantico, and minibar by José Andrés, as well as Los Angeles’s celebrated destination The Bazaar by José Andrés at the SLS Hotel at Beverly Hills. José also serves as culinary director for the SLS luxury hotel brand, a collaboration with sbe and Philip Starck. He next opens in Las Vegas at The Cosmopolitan with a redesigned Jaleo and a festive Chinese-Mexican spot called China Poblano.GQ magazine’s 2009 Chef of the Year, José is credited with introducing Americans to both avant-garde and traditional Spanish cooking. At Jaleo, he helped create one of the first critically and commercially successful tapas restaurants in the country. With the opening of his innovative minibar by José Andrés, Food & Wine hailed José as the “hero of the Spanish revolution,” who “helped create the Spanish food boom in America.” And The New York Times called him “the boy wonder of culinary Washington.” The James Beard Foundation recognized him with the award for Best Chef: Mid Atlantic in 2003, inducted him into the Who’s Who of Food & Beverage in America in 2007, and nominated him for Outstanding Chef in 2008, 2009, and 2010 for his work at minibar. His restaurants Zaytinya in Washington, D.C., and The Bazaar by José Andrés in L.A. were nominated for Best New Restaurant. He was recently profiled on 60 Minutes and appears regularly on NBC’s Today show. He’s been profiled in numerous magazines and newspapers, including The New York Times, The Wall Street Journal, Bon Appetit, and Saveur. Often referred to as Spain’s unofficial ambassador to the U.S, José is also host and executive producer of the PBS series Made in Spain. He has authored several cookbooks, including the companion to the PBS series, Made in Spain: Spanish Dishes for the American Kitchen and Tapas: A Taste of Spain in America. José is also a television star in Spain, where his production Vamos a Cocinar on Televisión Española (TVE) was the country’s most popular cooking program, revolutionizing food television in Spain. It now airs across Latin America and in some American markets on the Casa Club cable network. Richard Wolffe is an award-winning journalist and political analyst for MSNBC television. He covered the entire length of Barack Obama’s presidential campaign for Newsweek magazine, traveling with the candidate and his inner circle from his announcement through election day, 21 months later. His book about the Obama campaign, entitled Renegade: The Making of a President, was published by Crown in June 2009 in the United States. It became an instant New York Times bestseller. It was published by Virgin Books in the United Kingdom, Australia, New Zealand, India and South Africa; Carrera in the Netherlands; and Law Press in China. Wolffe appears frequently on MSNBC’s Countdown with Keith Olbermann and Hardball. On NBC, he has been featured as a political commentator on Meet The Press and TODAY. He is featured prominently in the HBO documentary on the Obama campaign, By the People, and played a leading role in the HBO documentary of the 2000 Bush campaign, Journeys with George. In April 2009, he joined Public Strategies as Senior Strategist at the communications and business advisory firm. He left the firm in December 2009 to work on his next book. Wolffe began writing about American politics as a senior journalist at the Financial Times, serving as its deputy bureau chief and U.S. diplomatic correspondent in Washington D.C. In that capacity, he managed coverage of business and political affairs in the nation’s capital, and reported on U.S. foreign policy at the State Department and National Security Council. He first started reporting on George W. Bush and his Texas team in 1999, at the start of the presidential campaign. He travelled with then-Governor Bush for more than a year, through the extraordinary election of 2000. His earlier work for the Financial Times included extensive coverage of the Microsoft antitrust trial and the Clinton administration’s plans to break up the company. His work on regulatory and business issues in Washington included covering the Treasury Department, the Federal Trade Commission, the Securities and Exchange Commission, and the Commodity Futures Trading Commission. Wolffe spent eight years with the Financial Times including four years in the United Kingdom. His business work there included financial reporting in the City of London, investment management and financial advisory firms, and the manufacturing sector in the British heartland. In politics, he reported on the tumultuous period leading to Tony Blair’s landslide victory in 1997. He joined Newsweek magazine in November 2002 as diplomatic correspondent, covering foreign policy and international affairs. In the 2004 presidential election, he covered the chaotic Howard Dean campaign before switching to John Kerry’s campaign. As Newsweek’s senior White House correspondent, his cover stories included What He Believes (on Obama’s faith) Black & White (about Obama and racial politics), Bush In The Bubble (about the president after Hurricane Katrina) and Weight of the World (the behind-the-scenes story of how Bush handled the Lebanon war). Wolffe is the co-author of The Victim’s Fortune, (HarperCollins, 2002), which reveals the behind-the-scenes deals that led to billions of dollars in compensation to the Nazis’ victims in the late 1990s. His reporting for the book covered major European companies such as Deutsche Bank, Daimler and Société Générale. It also encompassed government officials across Europe and the United States, and several high-profile class action lawyers. His next book was in an entirely different field: he is co-author of a Spanish cookbook, Tapas: A Taste of Spain in America, published in 2005 by Clarkson Potter in the US and Planeta in Spain. He co-wrote a follow-up book Made in Spain, published by Clarkson Potter in 2008, and wrote a 26-part TV show of the same name for PBS television. He has also written for food magazines such as Food Arts and Food and Wine. Born in Birmingham, England, Wolffe graduated from Oxford University with first-class honors in English and French. He lives with his wife and their three children in Washington, D.C.